Change Through Action: #PMFlashBlog Take Two! The first #PMFlashBlog led by Shim Marom was such a huge global success Mark Phillipy has organised a sequel with a twist. Each Monday for 7 weeks PMFlashBloggers around the world will release their posts about ‘Project Management Around the World’. Those in North America will publish in unison on 3 March followed by Europe on the 10th, Australia and New Zealand on the 17th and so on. This rolling schedule means we can highlight where we are in the world and the influence that has on how we practice, promote and deliver project management. Each week there’s further opportunity to connect with and listen to the bloggers as they share their thoughts and experiences on the Google+ PMHangout expertly hosted by Mark. 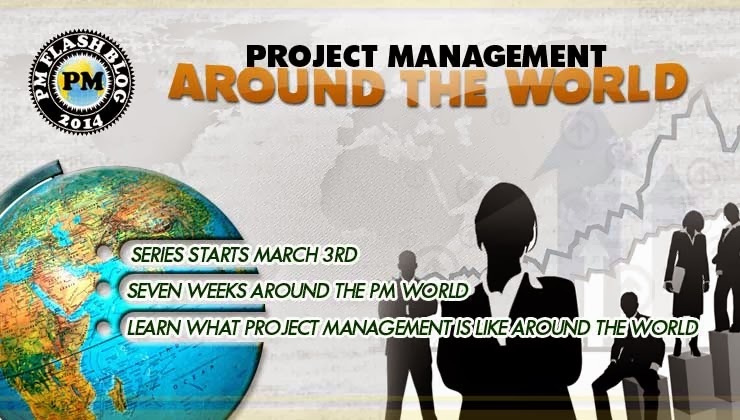 With 50+ project management bloggers already involved there’ll be loads of information and some eye-openers about ‘Project Management Around the World’. My #PMFlashBlog post will be out 10 March so why not subscribe to my feed, follow me on Twitter, and add the #PMFlashBlog tag to your twitter stream now. Don’t miss #PMFlashBlog Take Two! Can not wait to read yours. Kiva - Loans that change lives.